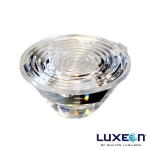 Optics allow you to control your illumination pattern, either diffusing it or focusing it as your application requires. 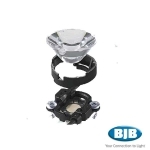 Secondary LED Optics provide a standard LED with collimation for spot, medium, wide and elliptical illumination patterns. 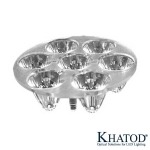 We expand on LED optics in our post called: LED Optics Explained. Do I lose brightness when using optics? Optical efficiency is determined by measuring the ratio of light collected after the optic and dividing by the total amount of light without an optic directly at the LED source. The simple answer is yes. 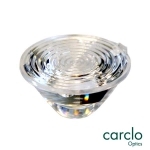 Carclo optics uses a technology called total internal reflection (TIR), so there is light loss during the collimation process. How do I get the tightest spot pattern possible? Full Width Half Maxium. A measurement between two data points on either side of the peak, where the light intensity is 50-percent of the maximum value. In general when talking about lens optics the larger the optic the easier it is to collimate light into a tighter pattern. Another consideration when trying to achieve a tight spot is the size of the LED die. The smaller the size of the die the tighter the spot. For example, to get the tightest spot with our LEDs you would want to use the Cree XP-E LED (smallest size die) and the 26mm plain tight lens (largest diameter optic).